Product #60819 | SKU P150-3HSD | 0.0 (no ratings yet) Thanks for your rating! 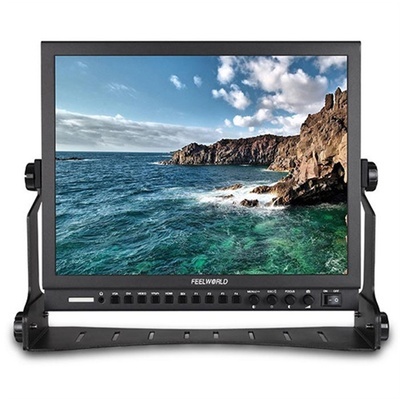 Monitor SDI, HDMI, or analog signals on the P150-3HSD 15" Broadcast LCD Monitor from FeelWorld. The FeelWorld P150-3HSD 15" Broadcast LCD Monitor has been widely used in TV news production, broadcasting houses, TV broadcasting trucks and other fields. Since this series works with other adjacent professional equipments, high stability, high reliability and electromagnetic compatibility are very important to make sure the whole system works smoothly. The full aluminium case not only makes the product more solid and durable, but also solves the problem of heat dissipation. The 1024 x 768 LED-backlit LCD panel can display SD and HD content for framing and analysis. The built-in monitoring tools include focus peaking, 1:1-pixel mapping, frame markers, and customisable picture-in-picture. Rear inputs include SDI and HDMI for digital sources, as well as component and composite video for legacy analogue sources. Audio embedded in the digital signal, or input via the RCA jacks, can be monitored using the built-in speaker or the 3.5mm headphone jack on the front panel.